I TAUGHT WRITING FOR MORE than forty years on the agricultural campus of a large Mid-Western university. Year after year I assigned students to write essays using extended comparison and then was bludgeoned by five dozen dreary essays comparing oats and barley, hard red winter wheat and Kansas Spring wheat, and the manners and morals of two rival National Football League quarterbacks. These essays were stapled and stuffed into cardboard folders of Lincoln green, the traditional color of Christian Hope. But my early hope died as over the decades the essays bludgeoned me with their slipshod sentences, their mindless conclusions, their sentimental blather, and their teeming grammatical barbarisms. The red knuckled children of the farm and the workshop were more like the thick tongued warrior, Ulfila than the lyrical Thomas Cranmer, more thundering Odin than John Milton, more Tarl the Viking berserker than melodious Dante. Devoutly did I seek, fervently did I pray, earnestly did I call out for a diamond in the rough. No diamond in the rough ever showed up; thus, my intellectually empty and spiritually joyless years in the composition classroom. I seldom went to conferences and my single and well focused research interest was in the work of Henry David Thoreau, the man Emerson said “could have been a great admiral, a great statesman, a major poet, but ended up having done nothing more significant than organizing a huckleberry party.” I felt a strong kinship with Thoreau. Passed over by our contemporaries, I believed that he and I drew our thought from a deeper source. We were lonely keepers of the literary flame. I forget the title of the lecture except that it was about the moral geography of America. I had a good deal of difficulty following the lecture which seemed to lurch off in several different directions at once. However, during the lecture Burke uttered a sentence I will never forget. He said (in effect for I wrote down what may be a garbled version of his exact words) “For Henry David Thoreau and the early Transcendentalists there could be no middle ground between nature and the wilderness. They did not permit equivocation. For people like Thoreau, nature must be the virgin and culture the whore.” Burke went on to say that there was nothing uniquely American about these observations. They were inherited themes, the exhausted sentiments of the Old World, the warmed over Classicism of Goethe and Schiller and Fichte, and the hard cheese stale folk tales that Washington Irving stole from the European arcana. I was so infuriated by these perspectives that I considered shouting Burke down. After the lecture I cornered him and attempted to refute him.The little man was actually delighted by my fury. My objections were like rich wine to him. “I understand you. I fully understand you,” he kept saying happily. His replies were astoundingly civil and good humored. After two hours of argument I was exhausted but Burke was still going like the Energizer Bunny. His stock of information about Thoreau was immense. Several people joined us and no matter what observation was made, Burke seemed to have what I can only call “instant context”. We continued our argument through correspondence. But Burke as a letter writer seemed far less fluent than Burke as a debater. Although he never convinced me that Thoreau was the last flatulent echo of the Greco-Roman agrarian tradition, I shall never forget the electricity of that encounter at Purdue. That was a long time ago. Burke is long gone. Cox is gone. My Lincoln green composition folders went into the paper shredders a couple of decades ago. But Burke’s stream of argument, example and narrative and the little horns of hair standing up above his ears are still vividly alive in the black projection room of my mind. He was always a man apart from anyone else, a man you remembered forever. In his thought he had spanned cultures, nations, and centuries. He interrogated Aquinas in his midnight study, traveled with Cervantes to Lepanto, and sparred with Carlyle in the Bobby Burns Tavern in Edinburgh. For more than seven decades he lived the life of the literary intellectual largely outside the university. We will not see his like again. The breed is extinct. *Dr. Barton R. Horvath is a pseudonym for a professor of Rhetoric who spent more than forty years teaching composition at a large upper Midwestern university (also not named by him). He also taught a well known undergraduate course on Transcendentalist Literature featuring the work of Channing, Emerson, and Thoreau. 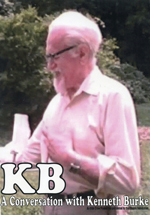 "The Burke I Knew; by Kenneth Burke Journal is licensed under a Creative Commons Attribution-No Derivative Works 3.0. Based on a work at www.kbjournal.org.